Just because your equipment reaches the end of its service life doesn’t mean your data problem is over. In 2015, technology companies shipped more than 2.6 billion devices containing hard drives, according to Gartner, the IT research and advisory company. They were inside desktop computers, laptops, servers, phones, USB thumb drives, printers, copiers and other equipment. Securis provides mobile, quiet, speedy, and secure shredding services to organizations hard drives, cell phones, backup tapes, DLT, LTO, thumb drives and other data storage devices. Performing these services at the client’s location enables their personnel to witness the process take place, thus maintaining the highest level of security and eliminating any chain of custody dilemmas. Securis onsite services can shred thousands of pounds of metal and plastic per hour. The Securis hard drive shredding process has been independently verified and audited based on the industry’s best practices. For a free pricing quote or to discuss your IT asset destruction needs, please fill out our quote form or call us at 866-509-7250. 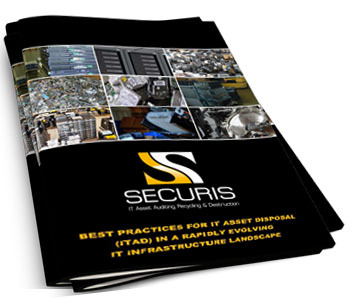 Securis has more than 10 years of experience in the critical role of IT asset disposal and e-waste recycling. We lead the market because we have a full stewardship of data, e-waste and the environment. Not only will we properly destroy your data, but we determine the best path to recycle your used electronics and e-waste, with a commitment to properly handling hazardous materials so they don’t end up in our water or land. Securis wants you to join us in a commitment to properly caring for customers and the places they live. Together, we can reduce your carbon footprint and ensure that you dispose of waste in a way that’s healthy for our planet and doesn’t put you at risk of fines from local or federal agencies. Securis’ mobile onsite shredding provides quiet, speedy, and secure shredding services of hard drives, cell phones, backup tapes, DLT, LTO, thumb drives and other data storage devices. Performing these services at the client’s location enables their personnel to witness the process take place, thus maintaining the highest level of security and eliminating any chain of custody dilemmas. To find the Securis office nearest you, click here. After the onsite hard drive shredding process has been completed, all destroyed materials are then securely transported back to one of Securis’ processing facilities to undergo the firm’s Zero Landfill, Zero Export treatment. Securis provides a comprehensive list of end-to-end IT asset disposal services performed at our secure, access controlled facilities in, including hard drive shredding, data destruction and e-waste recycling. Recycling and data destruction plans can be tailored to each organization’s needs, using any or all of Securis’ certified processing techniques.